The Auglaize County Historical Society’s Wapakoneta Museum is housed in the former First Presbyterian Church. Constructed in 1861-1862, the building is architecturally significant as the only example of the distyle in antis mode of Greek Revival architecture in an eight-county area of west-central Ohio (so named because of the placement of paired columns within the recessed front entrance). The Germans who settled much of this area disdained Greek Revival architecture, preferring Gothic Revival instead. The Wapakoneta Local History Museum, 206 West Main Street, Wapakoneta, Ohio. The First Presbyterian Church is historically significant because of its association with the early Auglaize County’s most politically influential citizens. They were not German immigrants, but had moved here from New England, New York, and Virginia (where Greek Revival architecture was more prevalent). 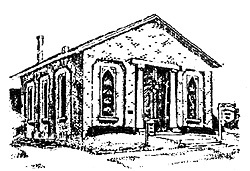 The First Presbyterian Church is the oldest extant religious structure in Wapakoneta and the oldest Protestant church in Auglaize County. The First Presbyterian Church of Wapakoneta was incorporated in 1860, but its years here were relatively brief. The congregation was rocked by financial scandal, causing membership to fall from 264 in 1922 to 20 in 1930. The church dissolved in late 1930 and its trustees sold the building and contents. Mrs. Ida Wintzer purchased the church and presented it to the Wapakoneta Woman’s Club for $1.00 (after which the tower was removed). The Woman’s Club met here until 1997, when the property was sold to the Auglaize County Historical Society. 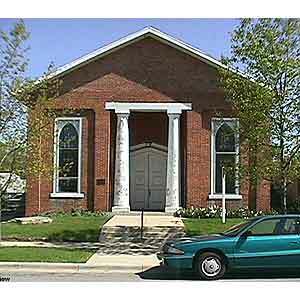 The First Presbyterian Church of Wapakoneta was listed in the National Register of Historic Places in 1985. Today the building houses artifacts from Wapakoneta and eastern Auglaize County. 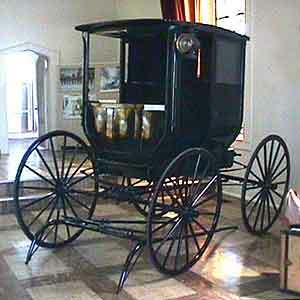 A Kreitzer Storm Buggy, manufactured in Wapakoneta. Throughout the 19th and early 20th centuries, Wapakoneta was home to many diverse industrial interests. 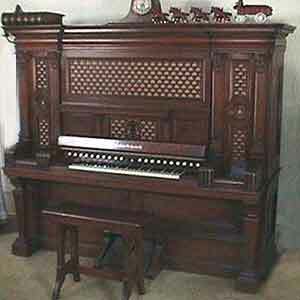 This Aeolian Ochestrelle organ was owned by the Herbst family of Wapakoneta, who converted it to electric power in the 1930s. 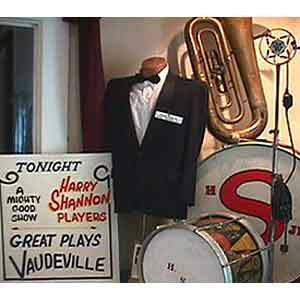 The Shannon Family Theatre Company was based in Wapakoneta, and son Harry later formed his own orchestra.